Taking nothing away from Comic Con, the assembly of tailgaters along Florida Route-401 at Port Canaveral was probably one of the largest collection of early morning geeks ever recorded. It was a carnival atmosphere, with fellow space cadets gathered from around the world to witness one of science’s greatest guilty pleasures–a space launch from Cape Canaveral Air Force Station. But this was to be no ordinary launch. This time around, the payload carried atop the United Launch Alliance Delta IV Heavy rocket has been 60 years in the making, named for Eugene N. Parker, a pioneer astrophysicist who predicted the existence of solar winds in a 1958 paper presented to an editorial panel who flatly rejected his claim. Four years later, NASA’s Venus probe (Mariner 2) measured interplanetary energy particles that eventually vindicated Dr. Parker’s belief. The Parker project was conceived for NASA by engineers at John Hopkins Applied Physics Lab in 2005, later amounting to costs running $1.5 billion in order to investigate the nature of our star, and gain an up-close understanding of solar winds. Originally, Leah and I were on the fence about whether we should make the 2-hour trek from St. Augustine for the launch last night. After all, we’d been burned earlier in the year when we attempted to catch a SpaceX Falcon 9 rocket lift-off (T Minus 3 Days and Holding) during January’s Florida freeze-out. But this time around, it was personal. Leah’s family had traveled to Florida’s Space Coast from Albuquerque last week (Tourist Attractions) with the intention of watching the Parker Solar Probe launch, only to be disappointed when the on-again-off-again mission was scrubbed for the third time on August 4, when a loose piece of foam was discovered inside the fairing. Daniel’s family was to be NASA’s guests to acknowledge SolAero’s design and fabrication of the probe’s photovoltaic assembly. Leah and I were to be tag-alongs. Although we had no official invitation for this morning’s event, Leah and I were still determined to bear witness as a tribute to Daniel’s work. We departed at 11:30 pm, and made easy time on I-95S, cruising down the interstate to an uncertain destination. NASA had delivered a 65-minute window for the 3:33 a.m. launch, so we would pad our arrival time in anticipation of getting situated. We knew we had arrived when we discovered a cluttered roadside collection of vehicles illegally parked along a shoreline clearing with an ersatz view of the gantry in the far distance. The eight miles separating us from the rocket would be as close as we could get, since access to the base was restricted and blockaded by a fleet of sheriff cars. After a couple of runs up and down the strip, I wedged the F-150 into a narrow gap of parked cars, barely touching the inside road line, but nevertheless legitimate enough to get a pass from the deputy. I found a vacancy among the scores of tripods already populating the tall grass beside the rocky beach, and staked my claim–although I felt totally inadequate and out-classed–while surrounded by all the super-duper telephoto lenses, and suffering from an acute case of optics envy. In preparation of the big moment, amateurs and pros alike fussed and fawned over their equipment, changing batteries, polishing lenses, accessorizing camera bodies with autodrives and cable releases, and participating in riveting discussions on ISO vs. aperture vs. shutter speed. Yet nothing could compare to the mobile telescope for astrophotography that occupied the largest footprint of our makeshift parking lot. Even its imaging display seemed more complicated than it had to be. While it was impossible to compete with all the big boys and their toys, I took a practice shot after setting up, although I knew the lighting would never compare to the day for night exposure once the rocket thrusters lit up the sky. Zoomed to the max at 600mm, the ISO set at 200, the aperture set at ƒ/8, and a 1 second exposure, my Lumix FZ300 captured this shot of the gantry 8 miles away. I reckon that if the atmospheric conditions had been less humid, the image would have been crisper-looking. The 3:48 am goal had come and passed without results. The revised launch time was pushed to 3:53 a.m. The countdown resumed at T-minus-four, and again–for some unknown reason–the launch was suspended while engineers determined the fate of the rocket. When NASA calculated to green-light the launch at 4:28 a.m., the buzz around us was that this would finally be the moment. Nobody would dare admit aloud or to themselves that this was just another dress rehearsal. We mostly waited in silence for the next half-hour. The sound of jumping fish in the darkness was a pleasant distraction from the drone of distant internet reporting from a fan’s elaborate sound system. “Hold, hold, hold!” announced an engineer from Launch 37 Command Center. The rocket’s helium pressure system had tripped an alarm, taking the launch back to T-minus-four. The 65-minute launch window was quickly closing with ten minutes left, leaving insufficient time to troubleshoot the red flag and light this candle. The mission was aborted and a collective sigh crossed the highway. Leah and I drove back home with the sun rising over Matanzas River as we approached St. Augustine. My sole consolation was knowing that besides driving roundtrip for a still picture of a rocket strapped to a gantry in the distance, all I had to do was unmount my camera and fold up my tripod, while somebody else had to wrap up and tow away that enormous mobile telescope. Flight officials determined that in 24 hours they would try all over again. …if I can keep my eyes open. Long before we established Florida residency, our water bills were ridiculously high, averaging $500 per month. Leah and I immediately suspected that during our three-month absence–between closing and occupancy–the irrigation system zoned around our yard was bleeding us dry. Was this truly to be the continuing cost of keeping our flower beds wet and our lawn green? And if so, was this property threatening to become our Waterloo? No doubt, our water usage was worthy of an investigation, but the city water department was dismissive–offering precise and up-to-date historical data of our consumption–so we turned to our long-distance neighbors for perspective and to the builder for relief, while wondering which direction to go. A plea for answers and advice via social media prompted a measured response from Lisa and Greg, new community Facebook pals, who offered to monitor the irrigation interface over a time for evidence of any irregularities or abnormalities. Greg’s systems check of our Rain Bird controller soon revealed a broken drip head now gushing water, and a twice-a-week watering cycle (as planned) irresponsibly programmed to repeat twice a day by the original landscapers. Greg recommended shutting down the timer, and offered to manually manage the irrigation zones in accordance with the forecasted rainfall. We were indebted to Greg and Lisa for their vigilance, and dutifully took over on water watch for the month of June and thereafter. A new appeal to the utility office revealed a literal disconnect between our residential meter and parallel irrigation meter, resulting in unnecessary sewer charges every time we watered our lawn. Yet despite our conservation efforts, our newest utility bill was only reduced by 10%. It was time for a new strategy; we would dig an artesian well, and feed our grass and plants with our own well water. Of course, the process demanded that we file a permit with the city; petition the architecture committee of our Home Owners Association for permission; find a reputable well digger; wait for the job to be scheduled (weather permitting)…and continue to pay exorbitant water bills in the meantime. Finally, three months from our earliest consideration, the drilling equipment appeared one late morning in our yard without warning. without benefit of knowing how deep or how difficult the drilling would get, although the placement of other artesian wells within our community (a retired golf course from the 1950s) informed that 250 feet was a worthy depth to plumb before groundwater made its way to the surface. the drill mast was ready to raise. The generator started cranking at 9am. By 11am the drill rod had blazed through 95 feet of clay and sand. eventually reaching a ledge of limestone cap rock at 225 feet. The boring rods were replaced with PVC pipe, and anchored in place with cement. The next day saw slow but steady progress, as a slimmer rod and bit sank into the hole to chip away at the more resistant stone. Robbie pre-wired the pump, and cut off power to the panel at 11:15am to make the connection. I was stepping out of the shower at the time when the lights went dark, the AC had paused, and Agent Strzok’s House Inquisitors were no longer embarrassing themselves on my bedroom TV. It was eerily quiet except for the growl from a nearby generator. It took me a moment to figure out that this was not part of a rolling blackout to cool down an overloaded town grid. Nor was it the drill guys in the yard, who would have been lit up after accidentally severing my buried power cable. It would take three additional hours to grind through another 15 feet of compacted limestone until fresh groundwater eventually flowed to the surface. Robbie dug a trench to the pump, and tied into the irrigation backflow, protecting us against future contamination and eliminating our dependence on costly city irrigation water. All that was left to do was pay the well digger, and put the water to good use. Although we’ve recently received June’s water bill crediting the city’s bogus charge for superfluous sewer usage, we will anxiously await the next billing cycle, already knowing that the grass is always greener on the other side. he single-handedly reshaped the 20th century. No less famous and equally as successful, Henry Ford’s lifetime commitment to automotive innovation was without peer. resulted in the birth of the car-camping movement in America as we know it today: motoring across the country in search of fulfilling outdoor recreation and adventure. and a pack of newspapermen and paparazzi who would record The Vagabond’s every step and conversation. 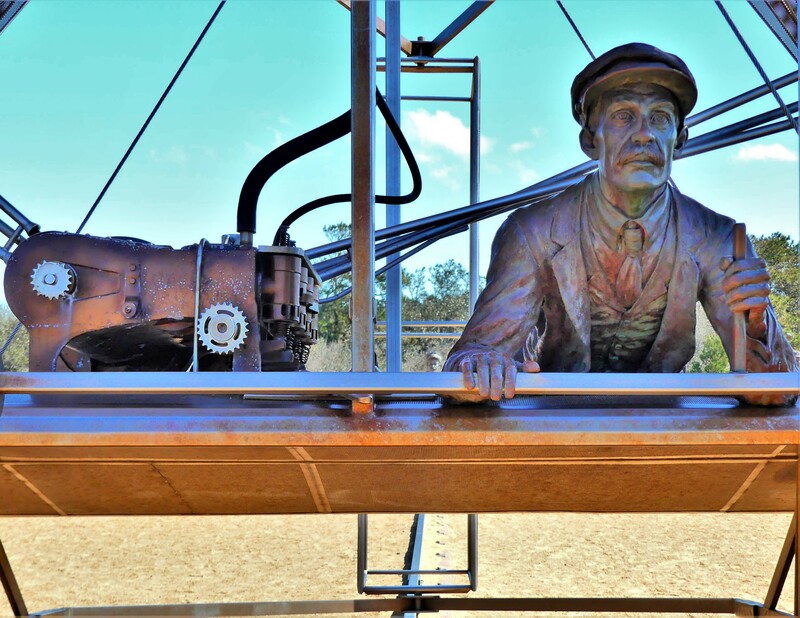 Edison’s inventions are presented in historical perspective in a comprehensive on-site museum space that credits Ft. Myers as an inspirational Eden for Edison’s genius. and Mina attended until his death in 1931.
and the two titans drove each other to continuing heights of excellence in achievement. But of all their noticeable accomplishments, their mutual love of country living coupled with the enormous publicity generated by their expeditions most certainly inspired an army of auto owners and outdoor enthusiasts to follow their example. Thus, The Vagabonds paved the way for the popularity of motor camping, and gave rise to a recreational industry that advances the dream of this sojourner’s lifestyle: where the highway is my lifeline and my Airstream is my cradle. Note: Historic photos courtesy of Edison and Ford Winter Estates collection. At first, the weather on the Space Coast was uncooperative–cold and rainy–but we were determined to time our visit in conjunction with a SpaceX Falcon 9 rocket launch–the first scheduled launch of the year, where the rocket’s reusable first stage would attempt a controlled landing back at Cape Canaveral Air Force base. Of course, we were departing for Playa del Carmen on Saturday, so we had also run out of time. and apparently, so would thousands of other visitors. With the rest of the country seemingly paralyzed by meat locker temperatures the first week of 2018, we felt fortunate to feel the sun through brisk winds and crisp air. a mission specialist, credited with flights aboard Atlantis in 2006 and Endeavor in 2008 to expand the systems and living quarters aboard the International Space Station. In addition to following her career from Navy to NASA, her presentation included factoids about the Shuttle and the shittle, detailing the water-recycling and freeze-drying properties of the squateroo. where freeze-dried ice cream was not an option on the menu (albeit, available at the gift shop). and a launch pad along the way. we were giddy with excitement to witness the technology that captured Kennedy’s imagination and took us to the moon. But nothing prepared us for the enormity of the Saturn V rocket stretching across a football stadium-sized hanger. which dwarfed the Apollo 13 L.E.M. hovering above us. Behind a bordering wall, the Apollo 14 capsule rested on a protected pedestal in a dimly lit room which seemed to heighten the drama. and have it safely return to earth…flying a total of 33 missions and over 126,000,000 miles before retiring! And how apropos, that the mission transport vehicle selected by NASA should feature an Airstream to introduce our astronauts into space? Unfortunately, the SpaceX mission that we so wanted to witness was put off until Sunday, when a worthier weather window made the wonder more winsome. This is how the launch looked to us from Mexico, where we streamed it in awe.